We recently attended a wedding at which the officiant spoke of those who couldn’t be there and asked that they be remembered in that moment. This always chokes me up, and predictably, I felt a tight squeeze on my hand. I looked over to see Andy also choked up. The same scene took place at our own wedding; both of us with tears in our eyes thinking of the family members we wished with all our might could be there with us. - She was an adventurous eater, always seeking out the newest restaurants and trying different cuisines. - She loved to travel. - She shopped at Goodwill and was known on occasion to come home with a piece of clothing, only to realize that it was a piece she herself had donated. She thought this was hilarious. - She drank coffee like it was going out of style: hot, iced, fresh, day-old…didn’t matter. - She was known to throw quite a party. - She had a ceramic cantaloupe on her coffee table that always had candy in it. - She was a crossword whiz. - She collected rocks. With a bucket in tow, she’d walk down the beach and select rocks that spoke to her. Her family of three rock-ducks sitting on our mantle is a whimsical (and highly coveted) reminder of that hobby. - She has a son who loves her dearly, misses her constantly, and always speaks of her with a smile on his face and a twinkle in his eye. With all my heart, I wish I could have met the woman who raised the best friend I’ve ever had. Andy promises me that we would have loved each other, and if her personality was anything like her sister’s, who I do have the good fortune of knowing, then I know he’s absolutely right. “Firecracker” probably most accurately describes them both. So when I was trying to decide on a pasta recipe for the Smart & Final First Street Grand Event, I threw a couple ideas Andy’s way, one of them being lasagna. Since I’ve never made lasagna, he immediately suggested that I make his mom’s version. Now, there is no recipe for this lasagna and Andy himself has only made it for me twice. I agreed to try it, but immediately got that nervous, oh-my-goodness-I’m-making-his-mom’s-lasagna-I-hope-I-can-do-this-recipe-justice kind of feeling. Knowing it would mean a lot to him if I stayed as true to the original as I could, I got some guidelines from him and got cooking, trying as best I could to channel a woman I’ve only heard stories about. In a large dutch oven over medium heat, heat olive oil and sauté onions until soft. Stir in garlic and cook for another minute, making sure garlic doesn’t burn. Transfer onion mixture to a bowl to cool slightly. Stir in cottage cheese, basil, thyme, parsley, eggs salt and pepper. Mix well. Reserve in refrigerator. In the same pot, cook ground beef until no pink remains. Drain off all fat. Add canned tomatoes and their juices, oregano, garlic and onion powders, salt and pepper. Simmer until most of the tomato juice is gone. Add about half the can of tomato sauce, tomato paste and red wine. Stir well and let simmer for about 30 minutes to allow flavors to develop. Meanwhile preheat oven to 350 degrees. Cook the lasagna noodles in salted water and according to the package until tender. After draining noodles, toss gently with a little olive oil to prevent sticking. When ready to assemble lasagna, spread remaining half can of tomato sauce on bottom of a 13x9 glass pan. Lay 4 noodles across the pan, overlapping slightly to fit, followed by half of the cottage cheese mixture, one third of the meat sauce, and one third of the mozzarella cheese. Repeat with another layer of noodles, remaining cottage cheese mixture, one third meat sauce and one third mozzarella cheese. Lastly, add one more layer of noodles and top with remaining meat sauce and mozzarella cheese. Sprinkle parmesan cheese over the top. Place the lasagna dish onto a rimmed baking sheet and bake for 1 hour, until top is brown and crusty, and lasagna is cooked completely through. (If top is getting too brown, tent a piece of foil over the pan.) Remove and let sit for at least 10-15 minutes before cutting it. *Notes: I cooked the entire 16 ounce package of noodles to allow for breakage. First Street lasagna noodles are made with durum semolina; use whichever noodles work for you. This is a hearty, comforting dish and makes enough to feed an army. I couldn’t have been happier with the way it turned out, and it even passed the “mom” test with Andy (whew!). To me, this recipe is about family, gathering together and sharing your day at the dinner table. It’s about knowing that no matter what these are the people that you can count on, even if you do fight over the crusty corners of the dish. I can completely picture Andy and his brothers in this scene, years ago. This makes me happy. I know it makes Andy happy. And I’m pretty sure it would have made his mom happy. This was probably a post I needed to read after breakfast, not before! Looks SOO good! Need to make this! ASAP! What a heartwarming post! I'm sure Andy's mom would have loved you. This looks so delicious, and what a great tribute to Andy's mom. Very sweet. Andy's mom sounds like she would have been great. I'm sure we would have loved her, too. 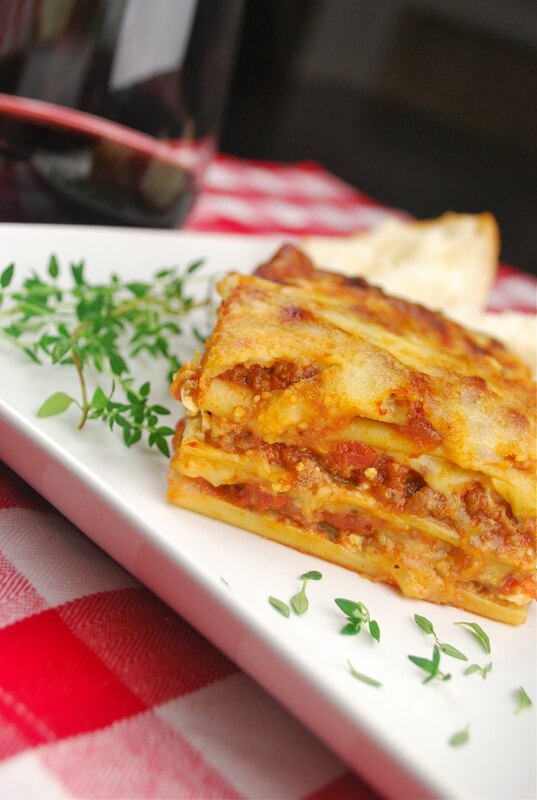 What a lovely blog post..... the lasagna looks amazing. What a touching post. This lasagna looks great! Love the cheesey top on it too. OMGOSH that looks amazing!!! A very touching tribute to your Mother in Law!! What a lovely post! 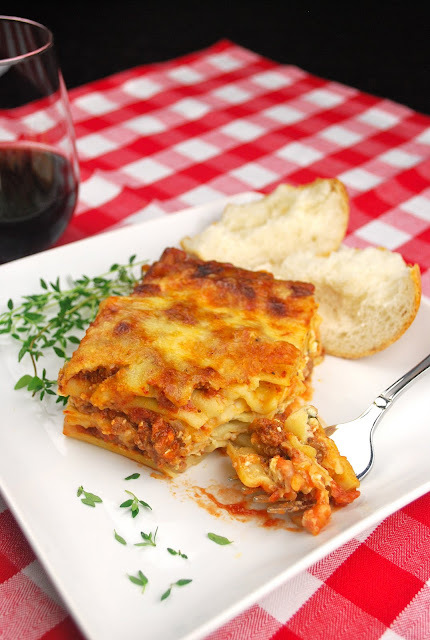 This lasagna looks perfect, love a good comfort meal! Thank you for sharing your story-I love recipes from family! I have not tried cottage cheese in lasagna before, but your recipe looks and sounds so wonderful, I am making "Andy's Mom's" recipe next time-thank you! I so love this story. It's exactly the kind of stuff I like reading along with a great recipe. The lasagna looks soooo good! This post made me hungry! I love lasagna. First, I am the soul who added your recipe to my eRecipeCards recipe box. Will be making this very very soon, I just love a recipe with a story. Looks great...can't wait to try your recipe! 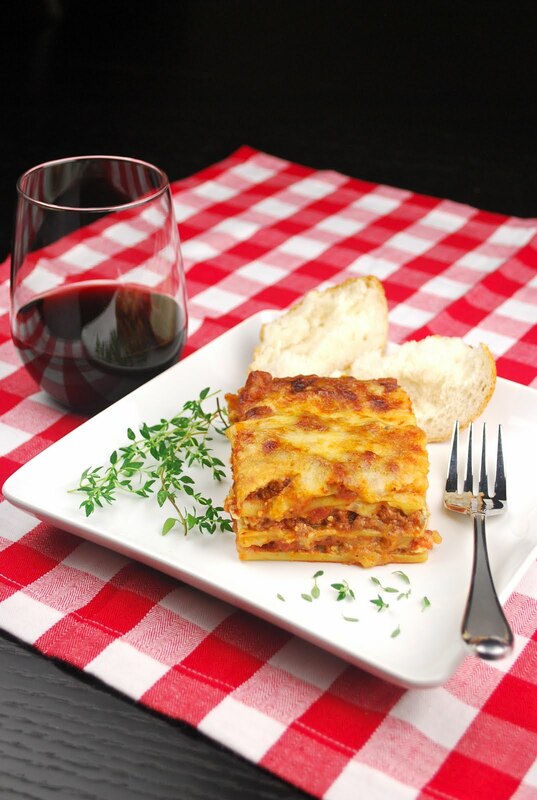 There is nothing like comfort food such as lasagna! Your dish and photos look absolutely beautiful! What a great lasagna recipe. I'm sure that your Mother-in-Law, would be proud of you. Beautiful pictures and post. What a beautiful tribute to an amazing woman! I wish I could have met her, too. Give Andy an understanding cyber hug from me. 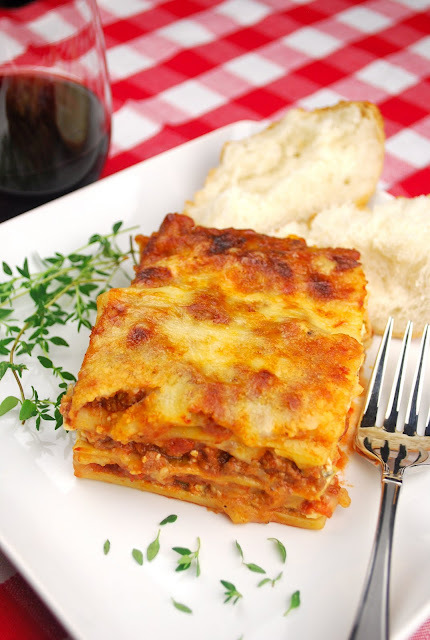 The lasagna looks amazing and your pictures are a feast for the eyes. Buzzed! This is a lovely post. I love lasagna, make it often. This looks delicious. Congrats on top 9! Looks so good. Your Mother In Law must have been a wonderful Lady and what a lovely tribute to her and Andy. i just lost my mom and family recipes always bring a tear to my eye... what a better way to say you care than with food, caringly prepared for the ones you love... Andy is very lucky! I am not a fan of cottage cheese (I always make my lasagna with cream cheese - rich, creamy, YUM) but i am going to try yours (and Mom's) Looking forward to a wonderful meal! Love this post Karen!!! The part about her shopping at Goodwill and buying an item she herself had donated cracked me up! I could so see myself doing that!!! She sounded like someone super fun and full of life!!! Your pictures are beyond gorgeous and scrumptious. And that lasagna - good Lord! You are making me hungry now! Such amazing photos and great story!! I need a second dinner now. This looks incredible. Hey Karen: I finally got around to trying this great recipe last weekend and everyone loved it! I've never made a lasagna without ricotta cheese in there somewhere, so I was a little concerned about the cottage cheese; not to worry, it was fantastic. Thanks for sharing the recipe and the story behind it. P.S. The Andrew Murray Vineyards Esperance paired beautifully with it! Independent Delhi Escorts Services gives you an opportunity to sleep with very Attractive Celebrity Escorts in Delhi and VIP High Class Delhi Call Girls Book Online now 9873940964 . It can vanish all the negative energy from your life, home or office Via cleansing rituals as well as prayers to remove the bad energy. Raise Your inner Vibration Frequencies to Experience the happiness of Success.